Children nowadays have their weekly schedules packed with tuition classes and extra lessons in school. Gone are the days when nearly everyone knew how to play the piano (or least was sent for piano class before). The art industry is growing and art centres for children are popping up like mushrooms on our little island. We celebrate Children’s Day with a special feature on Visual Arts Education for your child. 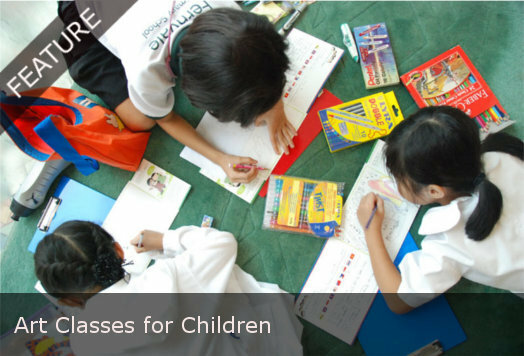 This art centre not only provides classes for children, it also specialises in art therapy. There are 4 centres; Katong, Hougang, Sembawang and Tampines. UniqArts is indeed very unique, we’ll tell you why. Firstly, they have designed their own courseware and published a popular series of drawing books “Drawing-Is-Easy” for children. Secondly, they have created an online portal for students to have their art lessons online so they can learn anywhere and anytime. (The wonders of technology) OnlineArtclass.com is an extension of their Art program. Better still, your child can go on to take Art as an O-Level subject because UniqArts’ Secondary Art Program is in line with MOE’s syllabus and criteria. For those who love watching cartoons, perhaps it’s time you made your own! The Animation-is-Easy course will teach 2D and 3D animation from production, shooting, voice over, editing to final animated film or movie. Definitely Uniq. Wee Camp for 3-4 yr olds, Kinder Camp for 5-6 yr olds, Little Camp for 7-11 yr olds and Master Camp for 12-16 yr olds. The October 08 – June 09 schedule is up so you can register your child for the next camp. Vacation workshops are also available, held for 3 days straight. This entry was posted in Commentaries, Visual Art and tagged antonija gros, art boot camp, art classes singapore, art for children, artzine, kinderart, little artists, uniqarts, valerie oliveiro by artzine. Bookmark the permalink.